2. Cut the pumpkins in half and remove the seeds and fibers. Then cut the pumpkins into quarters. 3. Brush the exposed pumpkin flesh with a little bit of oil and place flesh-side down on a pan with sides (i.e., roasting pan or jelly roll pan). 4. Cover the top of the pumpkins with foil. 5. Bake in oven for 90 minutes to 2 hours, turning once in the middle, until a fork can easily slide into the pumpkin flesh. Remove from oven and cool. 6. Scoop out the flesh from the pumpkin skins and discard the skins. 7. In a food processor, blend the pumpkin flesh until smooth. 8. Place the pureed pumpkin in a sieve, with several layers of cheesecloth underneath. Drain in the refridgerator, covered, overnight for at least 8 hours. Discard any liquid collected. 9. Store pumpkin puree in the refrigerator or freeze. Note: I didn't have any cheesecloth so I used several pieces of untreated, all-natural paper towels instead. They worked beautifully. Brown butter is such a great ingredient to have on hand to add an extra layer of flavor or depth to cookies, cakes, savory dishes, and--of course!--pancakes. After making brown butter, I let it set in the refrigerator and then wrap it up in parchment paper or foil to use as I would regular butter. 1. In a small saucepan over medium high heat, melt the butter. Stir continuously to prevent burning. 2. Continue to let the butter cook until the solids at the bottom turn a deep amber brown color. 3. Remove from heat and let it re-solidify in the refrigerator. 1. 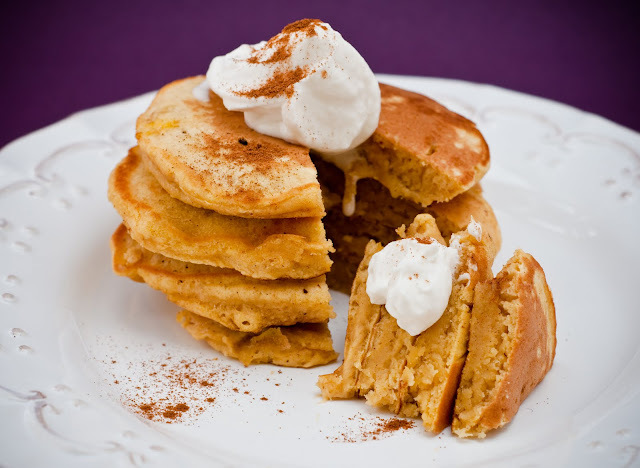 Combine buttermilk, pumpkin, eggs, melted brown butter, and vanilla in a bowl and whisk thoroughly. 2. Stir in powdered sugar, vanilla, and bourbon to taste. If something like this is for breakfast. Then I don't think I will be able to work at all. Such delicious pancakes, I simply can't resist. That too with bourbon cream. These sound perfect. I have some pumpkin in my fridge begging to be used. And what can't be improved by adding a touch of booze? 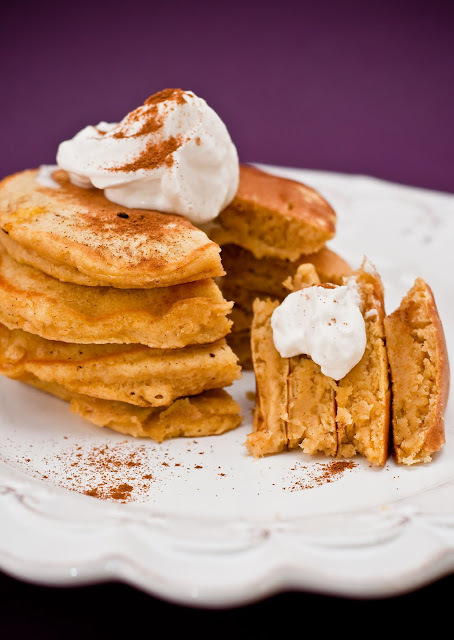 I looooooooooove pumpkin pancakes. I'll have to make these for my parents when I go home for Thanksgiving...just three weeks! @Anshika: now you know why I always have to take the rest of Saturday off! @leannabowles: I concur! The liquor in my liquor cabinet is pretty much exclusively for baking/cooking. @Andrea: home! I hope we'll overlap in either LA or SF!